I’ve long been a fan of Marcus Brigstocke, finding his engaging delivery and intelligent material a breath of fresh air compared with his peers who seem currently to churn out endless clichéd observations on everyday life. “God Collar” is based on Brigstocke’s Edinburgh Festival show that I wasn’t able to get to so I was especially interested in reading this book. 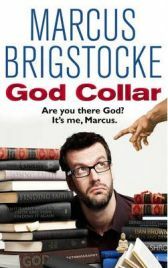 The premise of “God Collar” is that Brigstocke wants to challenge his own atheism; he wants to believe in God but can’t find any compelling intellectual reasons so to do. He calls this void in his life a “God-shaped hole”. The idea was spurred on by the premature death of his best friend, a tragedy that made Brigstocke look more closely at his relationship (or not) with God. Unlike many other comics, Brigstocke doesn’t mercilessly lampoon those who do believe and the respective holy books of those faiths; atheists attract as much scathing attention as believers and there does appear to be, at least a little, grudging respect for those who do profess to believe and therein lies one of the fundamental flaws in the project. The very term “faith” demonstrates that we don’t have any proof that what we (or those that do believe) actually believe in is based on concrete evidence. We don’t have faith in science: we believe in certain scientific facts because they’ve been proven to be true. By its very definition faith is having a trust in something we haven’t seen any proof of so Brigstocke’s argument really falls flat from the outset. In looking for evidence of something that believers don’t feel compelled to seek, Brigstocke here is really preaching to the unconverted. That said the book is full of Brigstocke’s trademark humour and is an entertaining if not really intellectually stimulating read. Brigstocke has a tendency to drift off into stand up style asides and as a result large chunks of this book read like a transcript of a live routine. The trouble is that Brigstocke is at his funniest when darting off into rants about things like the Royal Mail but here these comic interludes distract from the main event and it takes forever for Brigstocke to get to the meat of whatever point he’s trying to make at the time; at times he makes Eddie Izzard look like someone who sticks to the point. As eloquent as Brigstocke frequently is, some passages are too heavy, not because the subject matters demands it, but because of excessive wordiness and ultimately poor editing; in fact, at the end of one rather cumbersome chapter Brigstocke remarks “That last tirade seems reasonably likely to have thinned my readership down to you elite few who are not afraid of a touch of light ribbing” to which I can only wonder why it was included. The fact that Brigstocke has imbued this work with his trademark comedic style does diminish his arguments to varying degrees. He wants to answer thinkers like Richard Dawkins but his critique of that author’s “The God Delusion” is summarised by an accusation of “smugness” – hardly an incisive analysis. This is a trait that continues through the book and it left me wondering why anyone would bother going to the bother of doing all that research only to make a half-hearted attempt to discuss the ideas raised. “God Collar” would have been a much better read had it simply been an account of Brigstocke’s reaction to his friend’s early death. This element of the book is rather moving and sensitively written but somewhat lost in the confusion of jumbled ideas, unnecessary digressions and poorly referenced arguments. Sadly Marcus Brigstocke has squandered the chance to instigate a meaningful debate and the result is a mish mash of comic rants and half considered theories. Disappointing indeed. Thanks to Bantam Press for providing a review copy. No Comments on "God Collar"